Originally constructed in 1927, Hilton Baton Rouge Capitol Center stands proud blending both history and elegance in a landmark once called home by Huey Long. After more than $70 million in renovations, the once Heidelberg Hotel has been restored to its former state of grandeur. Overlooking the beautiful Mississippi River and located in picturesque downtown Baton Rouge, the historic hotel is adjacent to the Shaw Center and the River Center. 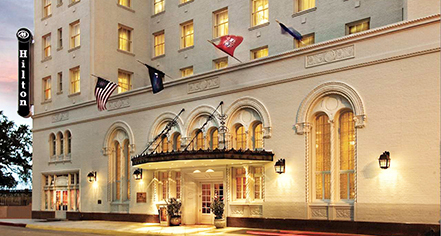 Guests can relax in a variety of guestrooms and suites with beautiful river and downtown views, savor Southern cuisine and cocktails in The Kingfish Grill, where governors and politicians have also dined, and experience Louisiana with genuine hospitality and services at Hilton Baton Rouge Capitol Center. 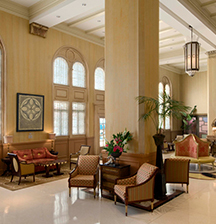 Hilton Baton Rouge Capitol Center, a member of Historic Hotels Worldwide since 2014, dates back to 1927. The hotel briefly served as the Louisiana State Capitol in 1931 during a power struggle between Governor Huey Long and Lieutenant Governor Paul Cyr. Accessible Rooms: (21) accessible rooms are available. Please notify request at time of booking. Airport Transportation: An airport shuttle may be arranged through the hotel's concierge. Cancellation Policy: 24 hours prior to arrival. Early Check-In/Late Check-Out: Early Departure Fee: $50.00 $50 charged each nt. guest departs prior to reserved departure date. Late Check-Out Fee: $50.00 check-outs after 12pm result in a charge of 50% of rm. rate. Extra Person Fees: $10 per person. Occupancy Restrictions: Maximum 5 guests. Parking: Self-parking: Not Available. Valet parking: $22.00. Secured: Available. Covered: Available. In/Out Privileges: Available. Other Parking Information: public parking garage and surface lot within 1 blk. Payment: All forms of payment are accepted. Payment is required at time of booking. Visa, MasterCard (also MasterCard Canada), Amex, Diners Club, China Union Pay, JCB, Carte Blanche and Discover are accepted. Pet Policy: Service animals allowed: Yes. Pets allowed: Yes. Deposit: $75.00 (Non-Refundable). Maximum Weight: 75 lbs. Shuttle Service: Complimentary within a 5 mile radius (including airport transportation). Originally constructed in 1927, Hilton Baton Rouge Capitol Center stands proud blending both history and elegance in a landmark once called home by Huey Long. After more than $70 million in renovations, the once Heidelberg Hotel has been restored to its former state of grandeur. Learn more about the History of Hilton Baton Rouge Capitol Center .